I was pretty busy with family stuff yesterday, but I managed to sneak out to the shop for an hour and make make some good progress on my bench top. First I did a little more work on the face. It’s pretty flat, I get full width shavings over most of the top, and it checks out with my giant straightedge. I haven’t decided if this will be the top or bottom yet, I’ll do that after I get the opposite face to the same state. I’m thinking about filling the checks with black-tinted epoxy like Christopher Schwarz did on his bench. Next I need to square up the four edges. Starting with the one that was the closest to being accurate of course. 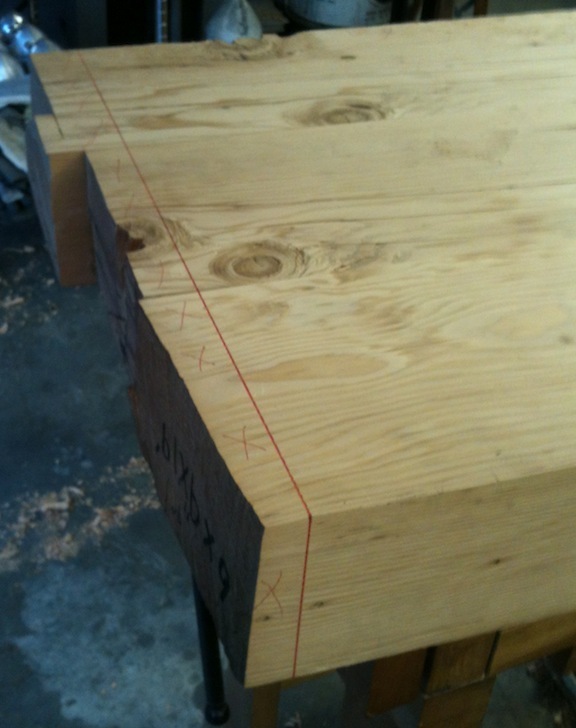 I stood the slab on the floor with the best edge edge up, and braced it by clamping it to a giant angle plate. I checked it with a straight edge along the length and with a framing square against the true face and the edge I’m working. I used the scrub plane to waste away the material to get it close, then switched to my toothed jack to get it trued up. Finally I made enough passes with the #8 to get rid of the texture from the jack teeth and to remove any little undulations. In this picture I’m still working with the jack plane. I’m not sure what my camera decided to focus on here, but it’s certainly not anything in the picture. I continue to be stunned about how much more effort it is to wield the #8 jointer over the jack or scrub planes. I’ve been thinking I should join a gym (usually I sit down and clear my mind until the thought passes), but if I keep up with this plane I think I’ll have it covered. Did I mention that I got a Care Package in the mail from Mark at Bad Axe? It had the resharpened D8 that I restored a few weeks ago. I’m eager to put it to use. I hoisted the benchtop back up onto my pseudo bench. 10 years ago I would have done this by myself. 5 years ago I would have thought I could do this by myself. Yesterday I got someone to help me. I marked out my first cross cut with the framing square and a red pen. I picked the spot to eliminate one knot and keep another from showing on the end grain. Finally I get to try out my D8. I kerfed along the vertical line first, then started along the top. This is my first experience hand-sawing like this, and I really had no idea what to expect. 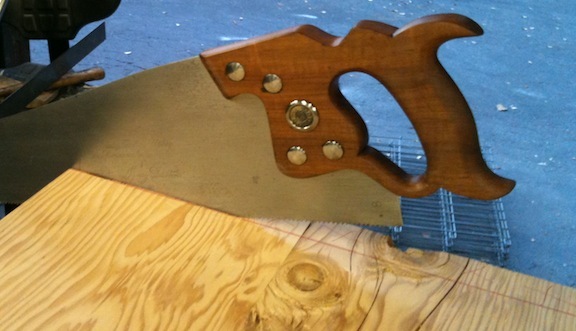 The saw cut easily, and I tried to keep my grip loose and push the saw without overpowering it. That seemed to work pretty well. 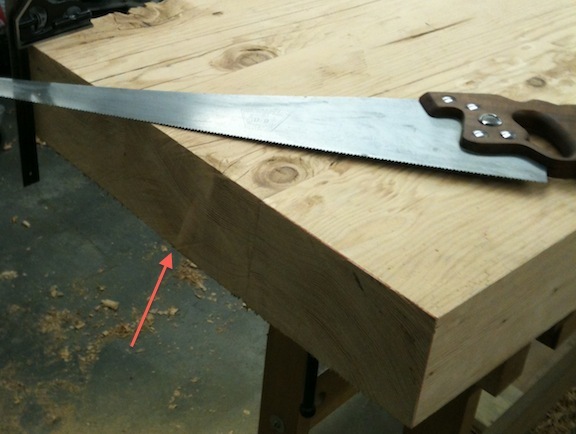 It wasn’t that much effort to cross cut this end, waaaay less than running the jointer plane over the face of the bench. In the end I did a so-so jab sawing. I ran into some trouble around the mid point, I think I was trying to twist the saw to keep it from biting into my layout line. 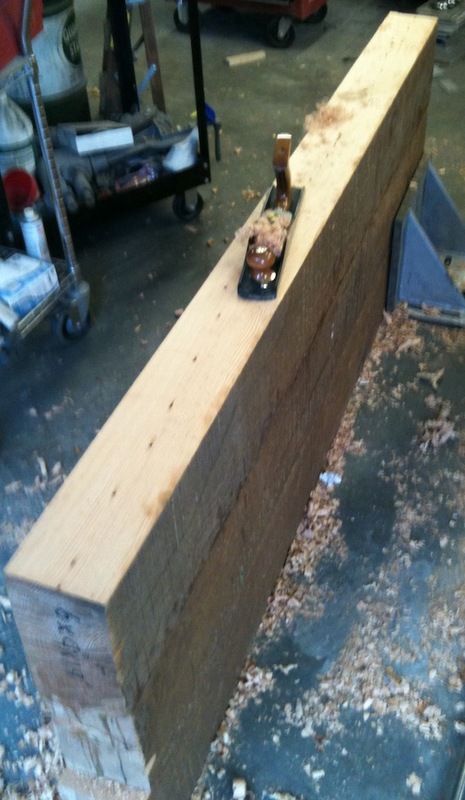 I pulled the saw out and started from the opposite end and finished the cut. The cut is very straight across the top. It’s square to the top at both ends, but it swells out maybe 1/8″ in the lower middle area. I’m sure it’s my (lack of) technique. I’m also sure that a little work with my plane I can fix it, and that my next cut will be loads better. I’m going to go find some material for the legs this morning, then I’ll get back to finishing off the benchtop. Wow, it looks like you’re making such good progress. BTW, you’ve inspired me to purchase a tooth blade. On Monday, I’ll post my final post on the tool cabinet and you’ll see the knots I had to deal with on that. I can’t wait to see how this turns out. It’s lookin’ great! Thanks Marilyn, I’m eager to see your tool cabinet! I was pretty nervous about the knots, but the toothed blade in the low angle jack laughs at them. 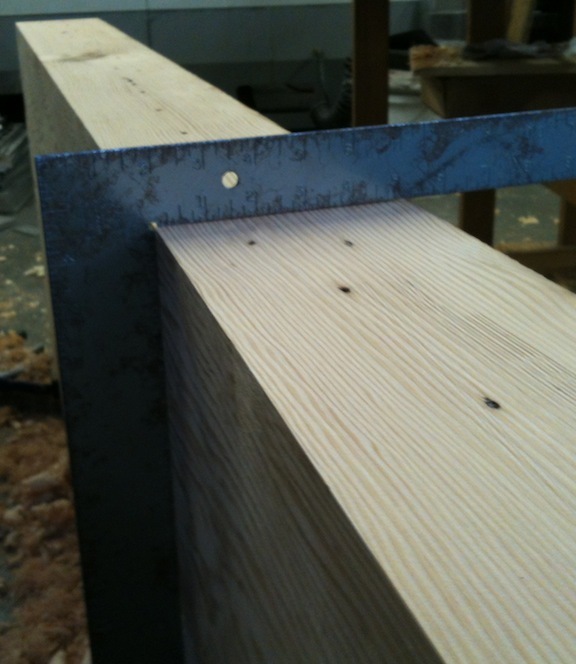 The jointer plan will cut them nicely as long as it’s a light cut, very sharp and I keep up the pressure. Sometimes I had to go back over a knot if it was sticking up just a little. If you were to get a bulge in a cut anywhere, that’s where you would want it to end up. You got two good ends and a nice line at the top . . . . A little skill, a little patience, a little luck . . . . nice work! 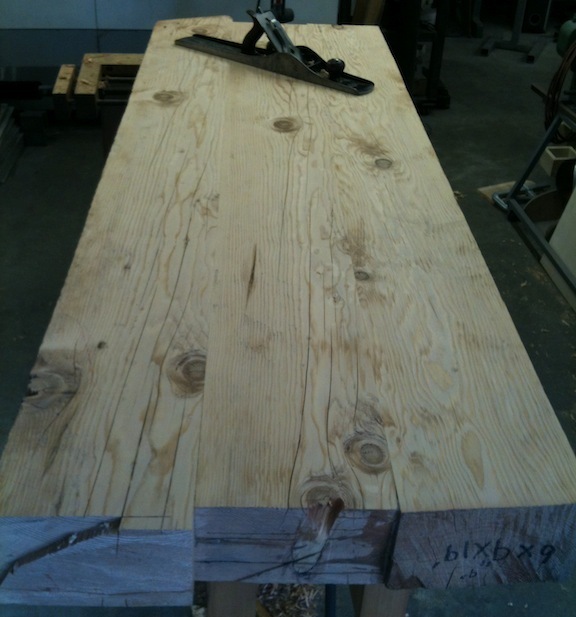 That’s one serious cut for a ‘first experience hand-sawing like this’ – you and the D8 did a great job!